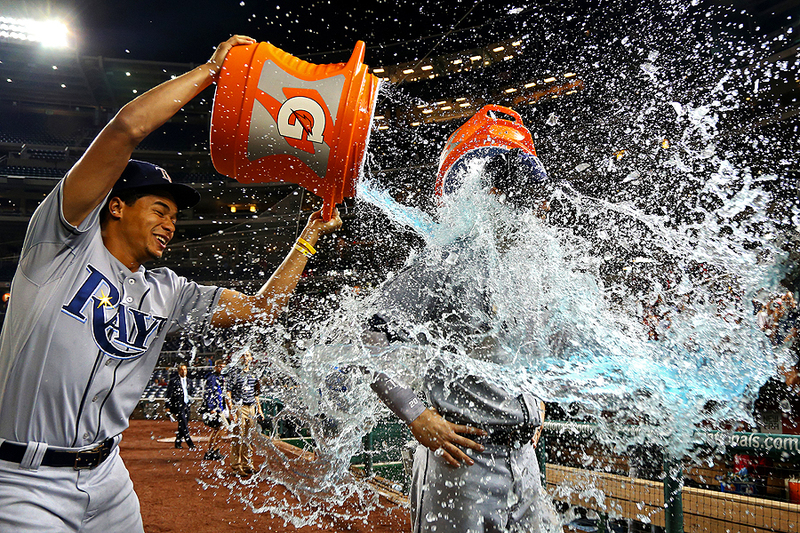 "Steven Souza Jr. #20 of the Tampa Bay Rays (center) is doused by teammate Chris Archer #22 (left) and David DeJesus #7 (back right) after defeating the Washington Nationals at Nationals Park on June 17, 2015 in Washington, DC." Weather usually makes great pictures - that is if you're in the weather to begin with. Venturing down to Nationals Park for a regular game between the Tampa Bay Rays and Washington Nationals I blanked on needing rain gear. Something I typically keep with me, yet a busy morning loading and unloading the car for home improvements, I totally forgot it. So as the rest of the photographers weathered the downpour, I documented from a distance shooting the game from the concourse staying dry. While I was being different, the entire duration of the rain I kept thinking I should just get wet and brave it out. But as hard as the rain fell, I thought it wouldn't be wise to leave gear exposed to the elements. A brief delay in play gave me the chance to get back tp where I started field level - just in time for the final pictch and a little gatorade celebration for Steven Souza Jr., of the Tampa Bay Rays. Between his little league style in the park home run to an overall great performance, his teammates thought it was deserving of getting wet again after the rain.